Sweet potatoes are awesome! They’re chalk a block full of vitamin A, beta carotene, and fiber. There’ve got manganese, some B vitamins, tryptophan, and potassium. Not only do sweet potatoes give you an antioxidant boost, help balance your blood sugar and reduce inflammation, they taste great too! 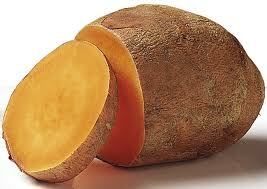 Cook your chopped sweet potato with just enough water to cover. When tender, strain off the liquid into a container and keep in the fridge. This golden liquid is sweet and delicious. Use it as a soup broth or add it to sauteed greens instead of water. I just made some collard greens with onion, garlic and sweet potato broth. The hint of sweetness adds a whole new layer to the dish. YUM! I may even try to bake with it…it’s that good!!! Great idea! When I make pureed soups, I usually drain off some liquid to make sure the puree is as thick as I want it to be. I find that another good source of liquid. Anyway, thanks for the post. This entry was posted on March 29, 2012 by katelivingfull in Nutritional info, Savoury Recipes.